August is really the month of Blade and Soul, Guild Wars 2, and World of Warcraft. Their in-game currencies prices have been significantly increased because of major events and expansions. WildStar, on the other hand, has the lowest price ever even though having a single-day highest price this year. Elder Scrolls Online is better than a previous month thanks to its recent update. FFXIV and Tera RMT price have been very unstable but expected to be better soon. Elder Scrolls Online Gold quickly recovered from its severe price drop last month with the new update Shadows of the Hist launched on August 2, 2016. This update alone increased the Gold price over 50% but the average cost of ESO Gold was still less than the period after Dark Brotherhood release back in June. Bethesda does not stop here. They are preparing to launch a next update 12 “One Tamriel” in October bringing change to an exploration system. 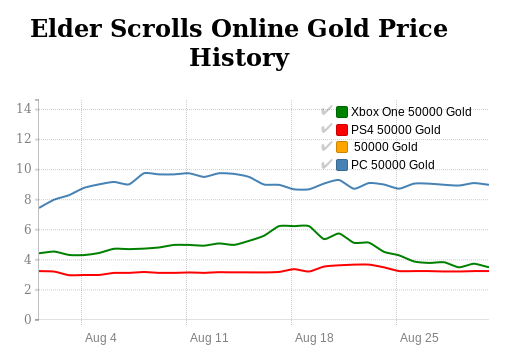 Elder Scrolls Online Gold price in September should be stable before it major rise in October. The cheapest was on August 1, 2016, which is 50,000 Elder Scrolls Online Gold for $7.45 and the most expensive was on August 12, 2016, for $9.76. It was 31.01% difference. Guild Wars 2 had been out for 4 years this month and the game was still doing okay, in terms of both number of players and RMT activities. To celebrate the 4th year anniversary, ArenaNet released several sales in an in-game gem stores as well as adding new items. In addition, Guild Wars 2 Gold price was on a rise once again after getting struck with their lowest price in history for several months. 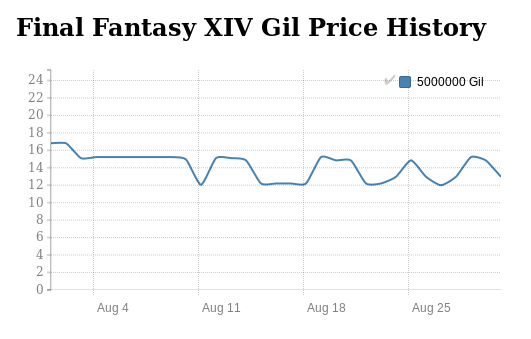 Starting from the second week, GW2 Gold price had been increasing slowly yet consistent until the end of the month. However, the average price is still lower than in July. It is predicted that next month Guild Wars 2 price should still be rising at a gradual pace. The cheapest was on August 8, 2016, which is 500 Guild Wars 2 Gold for $11.08 and the most expensive was on August 22, 2016, for $16.26. Although it was not a sudden change, Guild Wars 2 Gold price had a 46.93% increase. An average SWTOR US Credits price was slightly lower than a previous month despite the release of important update “Battle of Odessen” from Knight of the Fallen Empire series. In addition, the in-game currency price even decreased during the last week of August. With the upcoming new Star Wars the Old Republic expansion, Knights of the Eternal Throne, as well as the Rogue One, SWTOR Credits price should be higher again soon. The cheapest was on August 29, 2016, which is 10mn SWTOR US Credits for $5.85 and the most expensive was on August 4, 2016, for $7.20. It was at 23.08% difference. Tree of Savior Silver price was very consistent in August like it had always been in the past few months. The price became much higher after the introducing of Novice Pack, a new DLC item aiming to attract new faces to the game, on August 9. In addition, several new minimal and change were added were added such as skill rebalance, new items in TP shop, and class rank. Tree of Savior Silver price should remain unchanged for a while until the release of Rank 8 update in late September bringing new level cap, areas, and even map themes. The price increase should not be major, though. The cheapest was on August 3, 2016, which is 1,000,000 gold for $3.53 and the most expensive was on August 17, 2016, for $4.90. It was a 38.81% increase. This is the month World of Warcraft fan had been waiting for. Legion, the newest World of Warcraft expansions, introducing new epic raids, demon hunter class, maps, stories, and more was finally arrived. 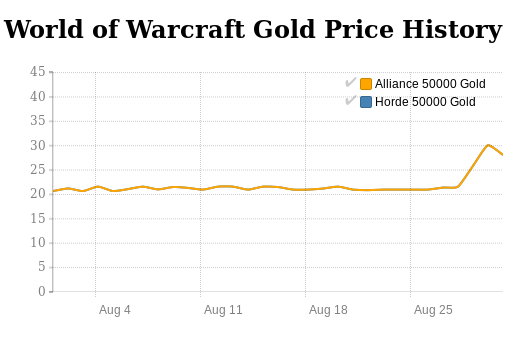 Only a day after the launch of the expansion, WoW Gold price had a rapid 45% increase after having been in the rate of $21 USD per 50,000 Gold throughout the month. Legion received good reviews from players all over the world which will make the RMT price to stay in this range for a while. World of Warcraft Gold should be high at least for a few weeks and start to decrease after that. The cheapest was on August 03, 2016, which is 50,000 gold for $20.69 and the most expensive was on August 30 2016, for $30.09. It was a sudden 45.43% rise.